If you are looking for information on the Conway's BBQ franchise business opportunity, Conway's Barbeque franchises or Conway's Barbecue franchising, then you have come to the right place. Bar be cue - these are fighting words for -fanatics of that all-American pig-out food. Barbecue lovers from different regions of the country are passionate about the meats, sauces, cooking methods and side dishes that constitute the best 'cue. At Conway's BBQ, we serve the best of all types of barbecue from across the South and Midwest, where barbecue is king. We smoke all of our meats fresh daily and serve them with a variety of from-scratch regional sauces and down-home dishes. Have a hankering for Texas-style 'cue, slow-cooked beef brisket with an aromatic smoke-n-fire dipping sauce? How about Memphis-style, tender pork shoulder topped with creamy slaw, all piled high on a bun? Or St. Louis-style pork ribs or chicken slathered in a thick, sweet tomato-based sauce, a favorite in Kansas City? Or cooked-till-it-falls-off-the-bone pork shoulder (Carolina-style), or ribs, smoldering and smoky with a vinegary or mustard-based sauce? Whatever sets your lips to smackin'; we have the best of all at Conway's BBQ. Why should we choose Conway's BBQ over other opportunities? Conway's BBQ was opened in Orlando, Florida in 1997. After many years of successful operation and continued growth in the most competitive restaurant market in the world, we developed a systematic business model by thinking outside our four walls!. Our belief is that too many restaurant operators fall victim to concepts that rely solely on revenues generated inside their establishments. Our franchise model represents several different profit centers in one location. When you visit one of our establishments you immediately become aware that there is something different going on. Our award winning BBQ is a given but how we get our wonderful products to the consumer in addition to inside our establishment is what separates us from the others. Typically, development agreements for 3 - 5 store exclusive territories are standard. Such contracts are individually negotiated for your territorial needs. Individual Franchises for single locations will be considered in selected areas. Conway's BBQ stated philosophy is to provide ample territory to develop the number of stores an individual desires in a very generous time frame. The number of stores in a development agreement is determined by the market size desired. Typical time frames would include 8 months for the first store and up to 12 months for successive stores. Does Conway's BBQ help with site selection? Does Conway's BBQ Offer Training and Support? Franchisees and their designated managers must attend and successfully complete the training program at our training restaurants in Florida or Pennsylvania. The cost of this initial training is included in your Franchise Fee. Franchisees pay their own costs of transportation, lodging and meals. 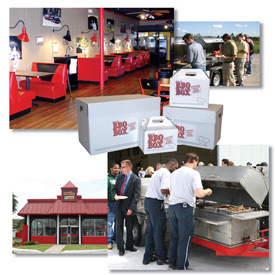 At the successful completion of our training program you will receive a confidential Conway's BBQ Operations Manual covering the many important facets of your restaurant operation. As the manuals are updated, revisions will be made available to you. You will receive periodic visits by our field representatives who will consult with you and offer useful advice and counsel on system elements such as quality control, service, identity, customer convenience, advertising, marketing, merchandise control, training, communication and incentives. Conway's BBQ continuously communicates with all Franchisees to assure that your problems are solved expeditiously. Does Conway's BBQ offer a finance program? No, but we have a list of potential lenders familiar with Conway's BBQ. It is then up to the applicant to qualify for the necessary financing for your land, building, and/or equipment package. Equipment financing is generally for a period of five to seven years at prevailing interest rates. We will also be available to assist you in lease negotiations with your landlord if you so desire. First of all, fill out the Application for a Franchise and submit it to Conway's BBQ. Upon receipt of your application, you will be contacted to set up a personal meeting with an appropriate corporate officer. After we have had an opportunity to meet each other and the necessary disclosure requirements have been met, the Franchise Agreement may be executed. Thanks again for your interest in Conway's BBQ.